It's been weeks since Puerto Rico was decimated by Hurricane Maria, and many of the 3.4 million American citizens on the island are still without electricity and other basics. The storm, which is now believed to have killed 34, up from 16 from the immediate hurricane itself, damaged much of the island's power grid, according to Gov. Ricardo Rosselló. Tesla Chief Executive Elon Musk offered to help rebuild the island's power grid when asked if he could help by a Twitter user on Thursday, suggesting that Tesla could pair their Powerwall batteries with solar panels and solar roof tiles, to provide off-the-grid energy locally. "The Tesla team has done this for many smaller islands around the world, but there is no scalability limit, so it can be done for Puerto Rico too," Musk wrote. "Such a decision would be in the hands of the PR govt ... any commercial stakeholders and, most importantly, the people of PR." Tesla has already done something similar, with a 52 MWh Tesla Powerpack installation and a 18 MW solar farm currently serving over 30,000 customers on the remote island of Kauai, Hawaii. The 600 residents of Ta'u in American Samoa also have their own smaller installation, meaning they no longer have to burn over 100,000 gallons of fuel per year. Musk claims the solution can scale to supply millions with solar power. And Gov. 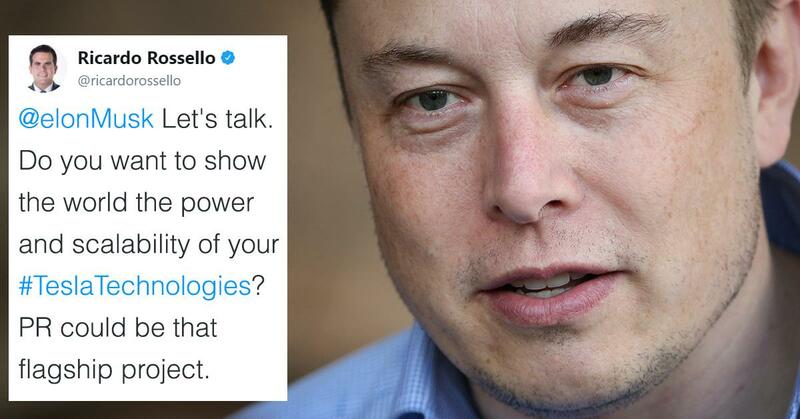 Ricardo Rosselló seems interested in the idea, replying to Musk's tweet with "let's talk." Puerto Rico's power grid is outdated, with the island generating 47% of its electricity by burning oil in 2016, compared to 0.6% for the entire U.S. The island generated 2% of its power through renewable sources, compared to 14.9% across the U.S. as a whole. Many have suggested that the decimation from Hurricane Maria could have a silver lining, presenting the opportunity to go green. As of June 3 2018, Musk has confirmed that he is making energy restoration on the island a Tesla “flagship project.” In April, Tesla shared that the company has shipped more than 1,000 batteries to the island which are currently providing power in 662 locations. In December, 2017, the company was working on six more battery projects in Puerto Rico for key services like Susan Centeno hospital, the Boys and Girls Club of Vieques, the Arcadia water pump station, a sanitary sewer treatment plant, and the Ciudad Dorada elderly community. The packs, which linked up to existing solar arrays, reportedly held 550 kilowatt-hours of power each.